Cupcakes 'n Daisies: It's new to me . . . I got a new old quilt in the mail yesterday. Do you remember Amaryllis? This is a top I pieced for Monique Dillard at Open Gate Quilts back in of April 2012. It's Lifetime Quilt #85. This is the first time I've seen the finished quilt in person. I pieced the top, mailed it to Monique, then she added a border, got it quilted, attached the binding, then carried it around to trunk shows and classes for the last 18 months. Monique promised that once its 15 minutes of fame, or in this case 18 months of fame, was over, she would send the quilt home to me. I'm not sure how she parted with this quilt so close to Christmas, I think I would have kept it, just a couple more weeks at least. I love this quilt, the fabric is Sentiments by 3 Sisters for Moda. This fabric has a nice romantic feel to it. 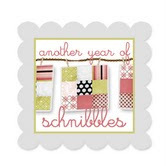 Did you miss out on Sentiments? I think 3 Sisters new Christmas line, Wintergreen, would look great made up into this quilt too. This is my chair and as I type this blog I have this quilt on my lap, sitting next to the Christmas tree, with the fireplace going. If I could just talk someone into bringing me some hot chocolate life would be perfect, but just having this quilt home for Christmas is pretty wonderful all on its own. The pattern is available here, I bet you're thinking you need your own Amaryllis, I could not agree more! Thelma it is absolutely beautiful! Your chair is the perfect place for it! What a nice surprise! Such a gorgeous quilt, and right in time for Christmas! Oh my....what a wonderful quilt and just perfect for this time of year....even right into Feb. and Valentines season. A really nice surprise for you Thelma and bet you will be using that in this chilly time of year! Gorgeous!! And just in time for Christmas! What a great surprise in the mail! 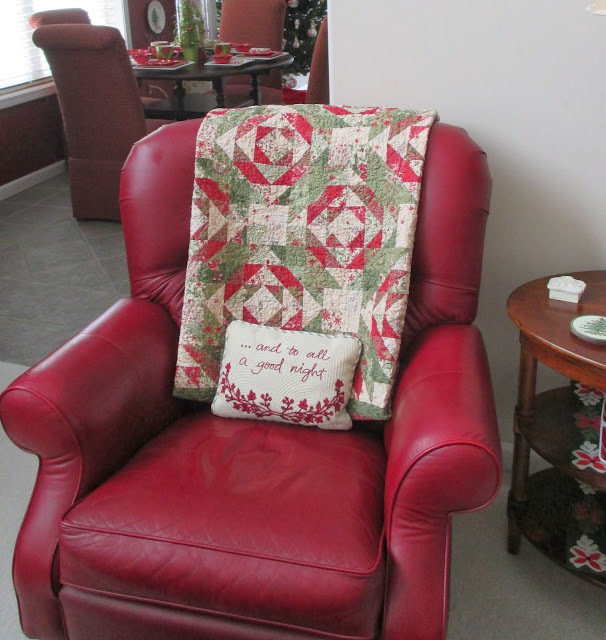 Beautiful quilt and perfect for Christmas and your red chair. Love your chair! That quilt is beautiful. What great timing to have it home for Christmas! Thelma it is lovely......totally worth the wait! It's lovely. How nice that it is home for Christmas and you can use it by the Christmas tree and fireplace. That sounds wonderful! What a gorgeous quilt and it looks wonderful in your chair! Wow, it certainly is a beauty!! Wow, what a beautiful quilt! 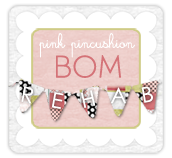 Love it on your cozy chair with that cute pillow, perfection! What a gorgeous photo! I want to spend the holiday season in that very spot!! Just absolutely fantastically beautiful :) And it sure looks nice on your red chair ;) Now, i have to go checkout Wintergreen lol Merry Christmas! Peppermint hot chocolate would do it for me! I love Monique's quilt designs and that one has such a classic look to it. Thanks for the link. what a treat to receive in the mail before Christmas. Great addition to your collection as well. Merry Christmas! The quilt is beautiful, glad it's come home. Beautiful! I just want to snuggle up in that comfy chair! It really does say Christmas. So beautiful! What a beautiful quilt! And it is perfect on your red chair. Yes, I may have to make my own Amaryllis! I LOVE that red leather chair, I'm putting one on my 'someday' wish list! And the quilt is gorgeous. It is beautiful Thelma! It's nice to have it home for the holiday's! Why don't I have a red chair like that? My husband has a red recliner. It would only be fair. I love when things arrive unexpected, Thelma!! It's beautiful and looks right at home! I am busy, getting last minute things done, we will be leaving this week end for FL and then a short trip with my daughter and 2 grandgirls - I am so excited to be with them - just us 4! If I don't get back to blogland, I want to wish you a very Merry Christmas and thank you so much for all the inspirations you have sent my way. I appreciate every time I come to your blog and you are so willing to share and let us know what has worked, how you changed things up and let us come into your home. Wishing you and your family a healthy new year in 2014!! It's beautiful! I don't know how Monique returned it just before Christmas either. Im off to look up the pattern now! I love your red chair and your set up sounds perfect. Have a Merry Christmas. Is your daughter coming home to visit?